My road to God began when I befriended some Christians from a Baptist church. For about a year they witnessed to me and gave me a New Testament to read. After reading for some time in 1990, I attended a church service where I accepted Christ and two years later I felt the call of God to the ministry. My wife was saved in 1989 and continues to be faithful to the Lord. She is a good mother and wife and Christian. ���Because of our many needs, our budget is $900 monthly but we only receive a little over $300. Obviously we do without many things in order to survive. The salary I have comes from the church I pastor. In spite of not having enough, I have chosen to be full time in the ministry. ���My family lives in a three room, rented house. We do not have land to grow crops so we have to buy all our food at the local market. My children know the Lord and help us in our work when they are finished with their school each day. ���Currently I am training a young man who will oversee the new church we are staring in Nisao de Bani. Besides this, I have started two other churches that now have their own pastors. 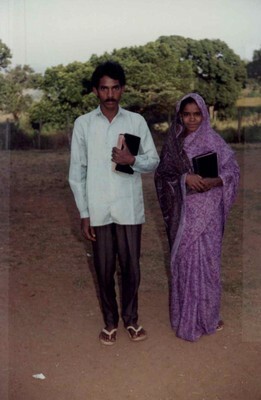 I am also teaching the Bible in home meetings in areas where we hope to plant new churches. This is what I need your support for more than even food. Our lack of finances in such a poor country limits our ability to travel to villages that are too far to walk to. But these people also need the Gospel so we go. With your help we can do even more. ���I am from a Brahmin family which is very orthodox and obedient to the elders, yet we have understanding not to follow if we are being instructed incorrectly. Our village people are illiterate, not caring for education because our land is so fertile. They see no need to read and write when the ground abundantly produces all we need in our kitchens.